I frequently make Greek yogurt at home. It’s a pretty simple process, but there are two moments where temperatures are critical. One is when the milk is heated to 180°F, and the other when it is cooled to 105°F. You add the starter culture at the latter temperature. Too hot and the culture doesn’t grow as well; too cool and it’s the same story. I was using a glass candy thermometer for a long time. I didn’t like having to wait for a temperature reading, and I found it difficult to get an exact read. I decided to buy a digital thermometer, and I went for one made by Taylor. 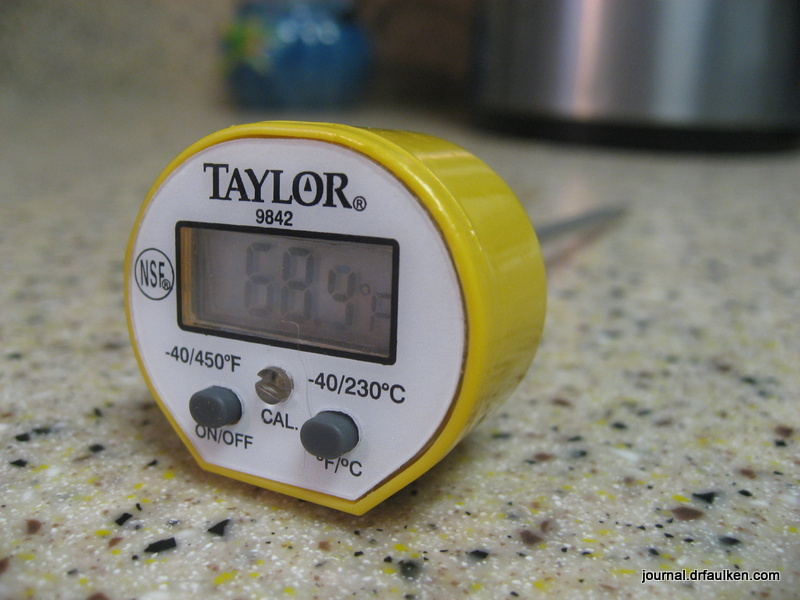 The Taylor 9842 is a one of their entry-level thermometers, but it has a lot of good features. One is it’s an instant read thermometer, which means it returns a temperature value very quickly. I wouldn’t say it’s instant, and some reviews on Amazon suggest inserting the thermometer before turning it on. Apparently the 9842 takes longer to adjust its temperature reading than more expensive thermometers. Anyway, it serves my needs pretty well. The Taylor thermometer has a temperature range of -40 to 450° F which is more than what I need. You can toggle between F and C.
When I calibrated the thermometer I noticed that the candy thermometer I was using was about 10°F too low, which meant I’d been overheating my milk. That might explain why a few batches were “off,” and also why my current batches are much thicker and consistent. 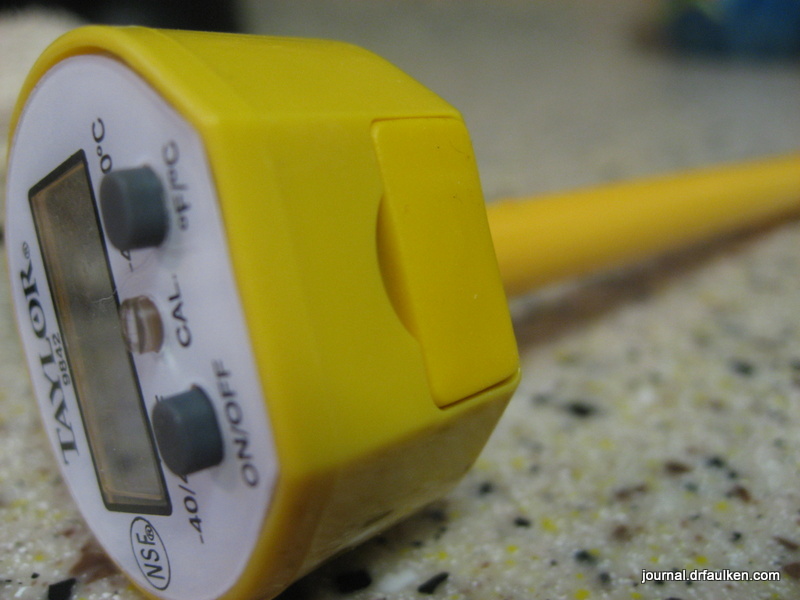 There is a less expensive Taylor digital thermometer, but it isn’t waterproof. I read some reviews online that it wasn’t even water resistant, so I paid a few extra bucks and got the waterproof one. Not all is sunshine and bunny bottoms with the Taylor 9842, though. There are a few things I dislike about it. For one, there’s no auto-off. You have to push the ON/OFF button again, and while keeping the thermometer on full-time may have some use for “real” cooks, this is one of the only appliances or devices in the house that doesn’t automatically shut off. I think our blender and mixer are the only two other things that don’t have a timer or auto-shut off function. This weird little battery door can give you problems. The other thing I really dislike is that the battery door on the Taylor 9842. It’s a soft piece of plastic that smooshes into the harder plastic body. The problem is that the door doesn’t stay in very well, and the batteries have come loose during operation. I crammed the door in pretty hard after that. I still press on the door every time I use the thermometer. I wonder why they didn’t use the more common “battery tray” found on really small devices, or even a snap-locked door. Other than those two things (one I learned to live with, one I am watchful for) I think the Taylor 9842 does a fine job as an entry-level digital thermometer. It’s inexpensive and hopefully will be the last thermometer I’ll need to buy for a long while.